Kellie – I am a very big fan of your artwork and process. You have a magical element to your work that is instantly recognizable. I saw a picture you shared of yourself as a teen with one of your first dioramas, how old were you when you started to develop your style? Elly- *Thank you so much. When I was fifteen I told my mom that I wanted to be a paper artist when I grew up. She was an author of books on pop ups and thought she could give me an informal education in paper arts by introducing me to members of The Movable Book Society. We found a free train pass on the back of a Disney movie that and that solidified the idea. That summer, we took trains along the Eastern USA. It was such an adventure. 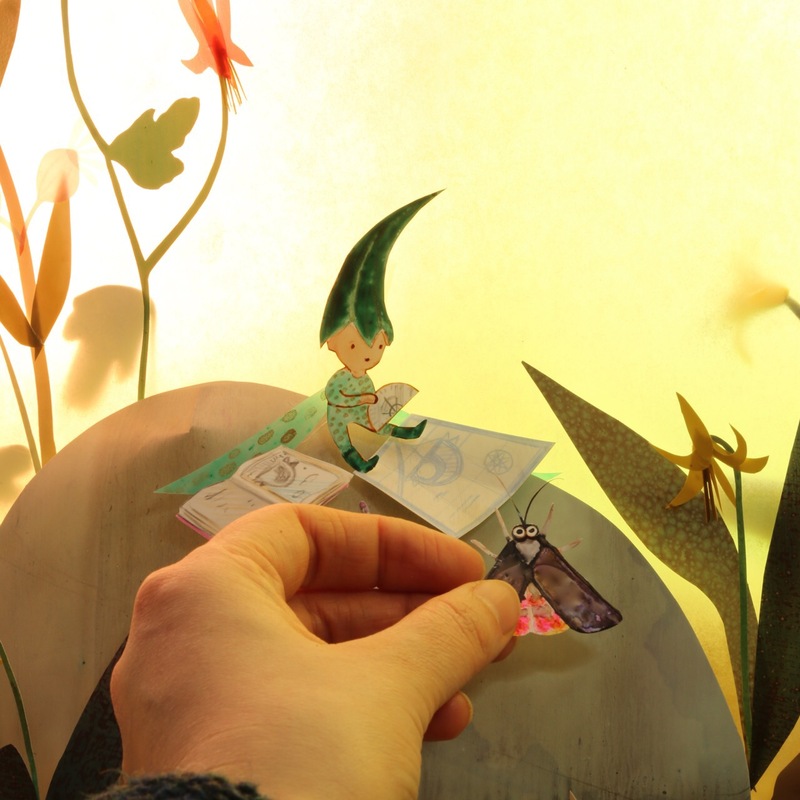 One of the artists, Ed Hutchins, introduced me to Victorian paper arts, things like tunnel books and paper theatre. When I got home I started making my own. I was asked to show my dioramas and zoetropes in Toronto at a paper convention the following year. That gave me such encouragement and from there a gallery asked to sell them. You can imagine the excitement at sixteen of making money, selling your art. It gave me the reassurance that it was possible to do this for a living, though it would be years until I made the leap to working full time as an artist. K- What brought you into making picture books? Elly- When my daughter was born we realized we wanted to live closer to family so we quit our jobs and moved north. I thought I’d take some time after my year of maternity leave to pursue art. In 2010, I started selling my art on Etsy (theaterclouds). It was a tough go at first. Just as I was about to search out jobs, an agent and publisher found my work there. It was incredible luck. It was 2013 when my first book came out. K- We live in Vancouver, a city surrounded by sea and my children and I are so excited to start noticing the sky changes we have learned through your book. 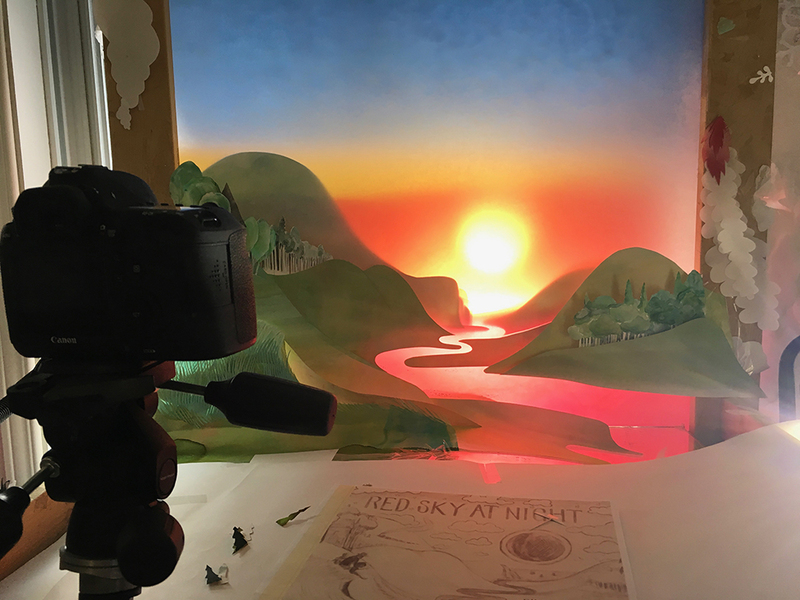 Red Sky At Night is a personal project close to your heart, can you tell us some of the inspiration behind it? E- I’m so happy to hear that. I hope a few of the sayings will stay with your kids. I loved watching storms roll in over the water when I growing up. You could see Georgian Bay from the big window at our house. My Dad taught me a few of these sayings. He is a real weather watcher. You might even find him out photographing the skies during a lightning storm. He was always teaching us to look closely at things in nature and ask questions. I try to do that with my kids too. Noticing a ring around the moon, or dew on the grass and seeing that one is followed by rain and that one means a sunny day ahead… these little observations are so interesting. These old sayings connect us to generations past. I love that. I find it empowering that we can rely on our own instincts. I can imagine a woman three hundred years ago seeing dew on the grass, and knowing it would be a good day to do laundry or perhaps seeing sea birds flying inland, and knowing it was time to take the animals in. My own kids have heard these sayings so much that now, they are predicting the weather. They are so delighted with they are right. 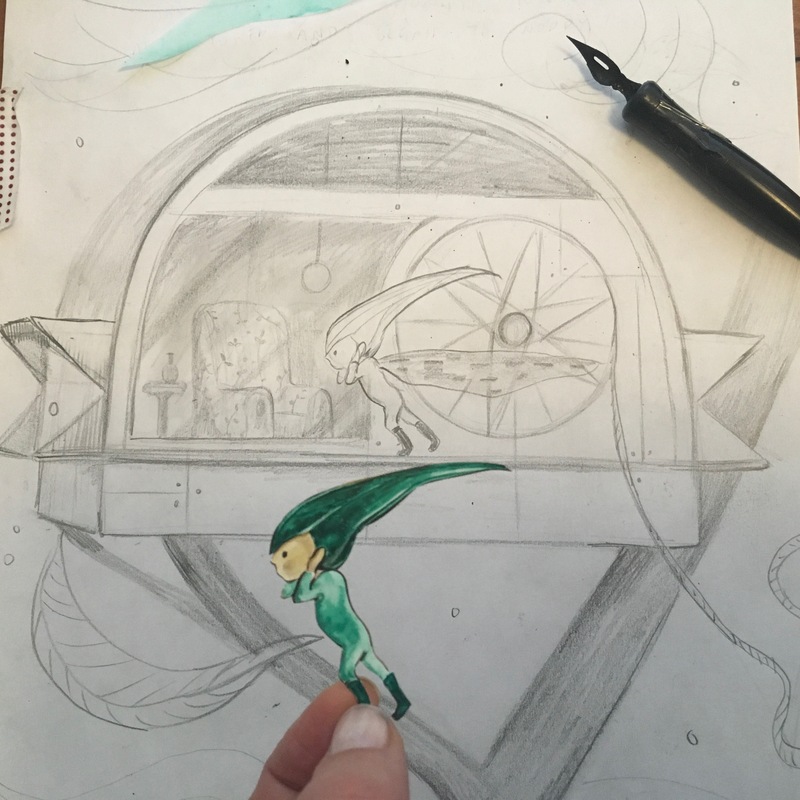 K- You have shared a little about the upcoming treehouse book you are working on. It is so exciting, tree houses are my favorite. Did you have a treehouse growing up? Have you created your dream treehouse? E- We had a treehouse when I was a kid. It was a simple red box with a circular hole for a window and lots of pulleys. The one in The Tallest Treehouse is much more elaborate. Unfortunately, it is only large enough for fairies. I’d love to have one just like it. K- Your artwork has a dimensional quality that most art doesn’t, how do you store your work? Do you keep it all? Do any pieces ever reappear in other stories? E- The dioramas I made as a teen took up a lot of space. When we moved up to Owen Sound my studio was the size of a walk in closet so I needed another solution. I drew a little theatre in my sketchbook, imagining that I could take out the layers of paper (little sets) after I’d taken my photos. My husband surprised me with the theatre for Christmas and I’ve been working that way since. I have drawers of clouds, flowers and other bits and pieces that I use from time to time. I keep the smallest things in tea tins. Often I find little things stuck to my socks too. K- What is a picture book you buy for other people as a gift? E- I buy so many picture books. If there is a unique one that our library isn’t getting in, I’ll order it, somewhat selfishly to read before gifting. I also pick up my favourites at junk shops whenever I find them, even though I already have a copies. I give them to friends with kids – books like Alligator Pie, Owliver, Pepper and Jam, Miss Twiggley’s Tree, The Midnight Turkeys, Mortimer, any of those classics. K- As a vintage book aesthete, I have to ask, do you have a favorite vintage book/illustrator/author? 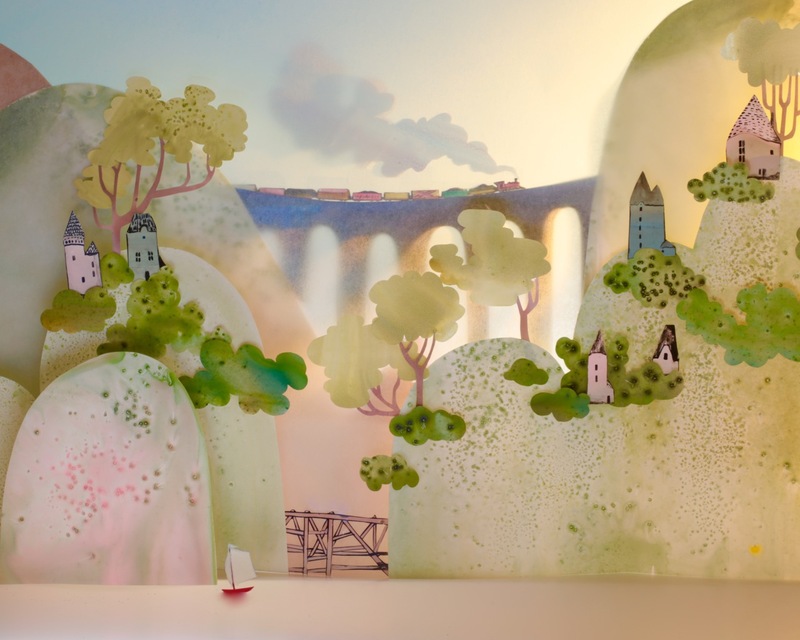 E- I love Ilonka Karasz’s landscapes. She did a lot of New Yorker covers. As a child I was really drawn to the fairies that Cicely Mary Barker drew. And perhaps my favourite artist growing up was Kenojuak Ashevak. She wasn’t an illustrator. She was an Inuit printmaker who often depicted owls, spirits and other animals. We had one of her prints and I thought it was the most beautiful thing. K- You have some great projects in the works, we are so excited to share soon. Is there an author you dream of working with (from the past or future)? E- If I could dream up a list of authors, Julie Folgiano, Sara O’Leary, Kate Messner, and Kevin Henkes pop into my head. And I’ve always wanted to work with Kallie George. This spring we both signed on a new book, called The Secret Fawn with Penguin Random House (Tundra). I think Kallie must have had a similar childhood. The little girl in the story was so relatable and the setting is at the edge of the woods. It is just the perfect fit. I can’t wait to begin the illustrations for it and I’ll be working with the same team of people that I worked with for Red Sky at Night. Thank you so much for this interview. I hope people will pick up Red Sky at Night at their local library or book shop and learn a few weather sayings. It might make you look at the world a little differently the next time you are cloud watching.